Now that Microsoft has officially released Windows 7 to the public, here are some screen shots showing what Microsoft has changed around this time. Underneath the hood it is not much different from Vista (Windows NT 6.0). 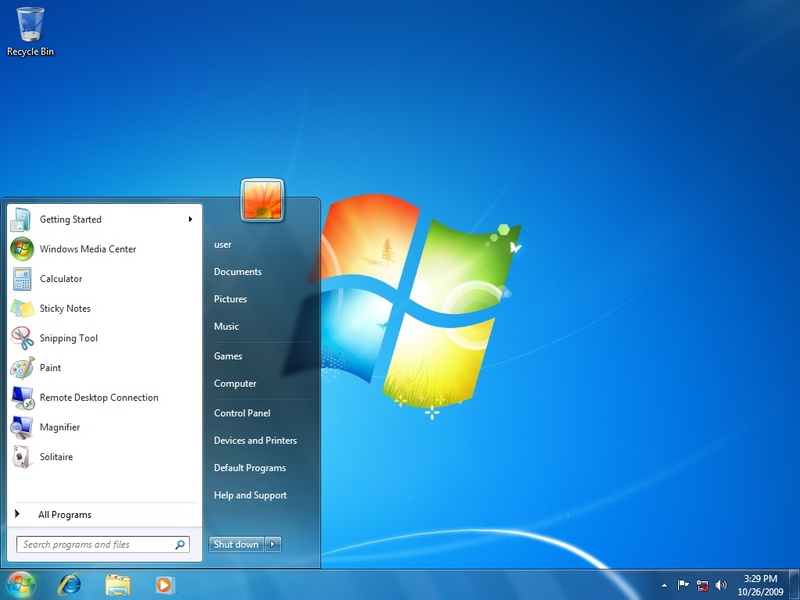 In fact, despite the name "Windows 7" its actual version number is Windows NT 6.1. 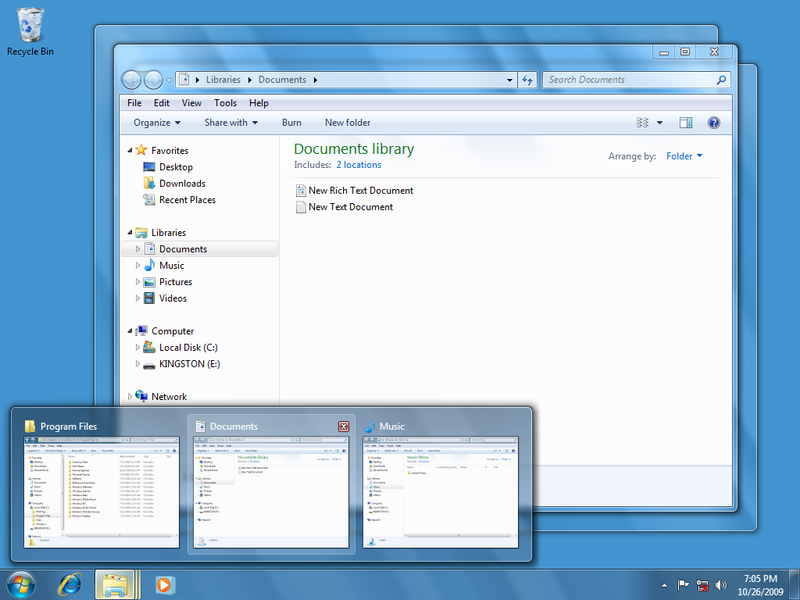 The default Windows 7 desktop. The background always defaults to this Window logo decorated with birds, butterflies, and trees. Is that a fresh pine scent I smell? Flip 3D, The Exposé-like thing that previews all windows at once no longer has a button on the desktop but can still be accessed via the keyboard using Win+Tab. The "Show Desktop" button has been removed and replaced with a slim button-like thing on the right of the task bar. Search is no longer on the start menu. The "Internet" and "E-Mail" icons in the start menu that point to default applications are gone. The Task Bar has been significantly altered. By default the Microsoft Internet Explorer, Windows Explorer, and Media Player icons are prominently displayed on the task bar. On the task bar, Microsoft has removed the "Quick Launch" shortcut area. Instead, icons of executables are "pinned" to the task bar and double as the application icon when the application is running. This makes the task bar work more like the Dock on the Apple Macintosh. 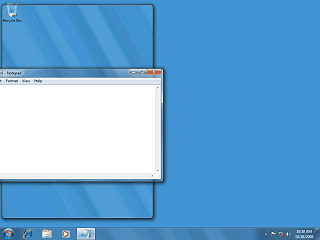 In this example, Paint and Notepad have been "pinned" to the taskbar, and IE has been "unpinned". Paint is not running, but two instances of Notepad are running and the Notepad icon changes to look like a button. The right-click context menus can also now contain various application specific options. Right clicking no longer lists open windows, but that is ok since single clicking lists the open windows. Most system tray icons also have new simplified menus that appear when you click on them. Windows Vista already added window previews, but in Windows 7 hovering the mouse over an icon with open windows previews all of the open windows. Hovering over the thumbnail brings that window to the front while making others transparent. The sidebar has been removed and is no longer necessary. 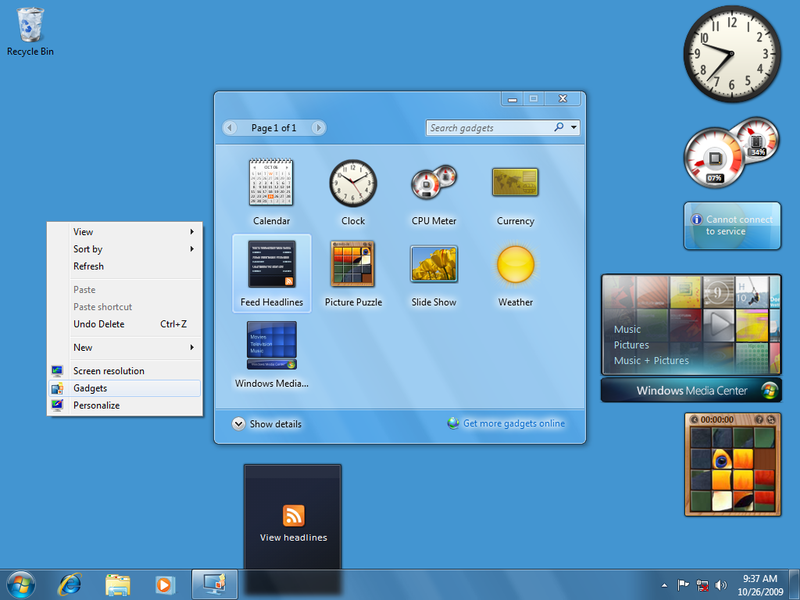 Gadgets, which had been confined to the sidebar in Vista can now be placed anywhere on the desktop. Apparently Gadgets are considered important enough they now deserve a place on the right-click desktop context menu. 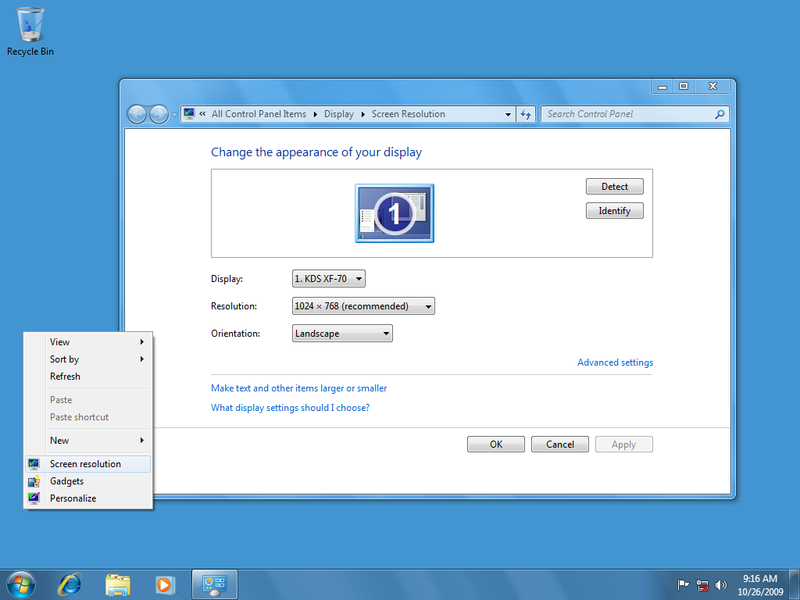 The desktop right-click context menu also now contains a "Screen Resolution" option. When Microsoft replaced the "Display Properties" menu with the "Personalize" menu in Vista, users had to wade through the more complicated webby style "Personalize" window to get to that. I wonder if MS actually listened to consumers on this one or if it was just to stop the chair throwing when Balmer tried to use his laptop with the projector in meetings. A minor interesting addition to the general window management is that dragging a window to the edge of the screen can resize the window. Dragging to the top or bottom will maximize the window while dragging to the left or right will "tile" the window to half of the screen. Note that "Tile Horizontally" and "Tile Vertically" options are no longer in the right-click Taskbar context menu. Tiling has been a feature of Microsoft Windows since version 1.